Accent your chairside with this stylish, transitional end table. Pine veneers and solids have been wire brushed with a stone white wash finish for a unique look. Cabriole legs support an oval shaped top perfect for holding drinks, displaying decorative items and much more. 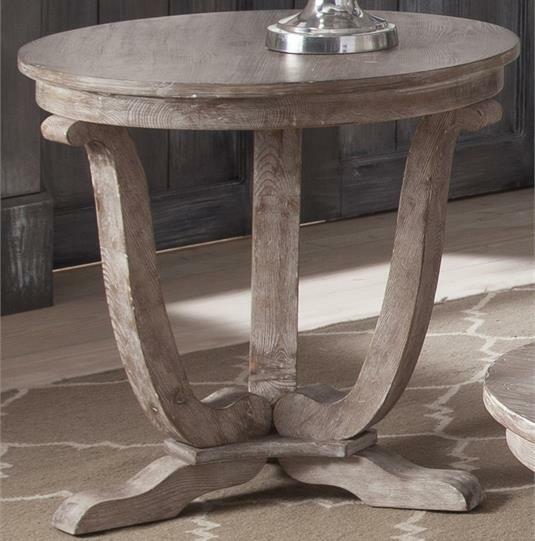 The Greystone Mill Transitional Round End Table by Liberty Furniture at Miskelly Furniture in the Jackson, Pearl, Madison, Ridgeland, Flowood Mississippi area. Product availability may vary. Contact us for the most current availability on this product. Traditional silhouettes are paired with a casual, yet refined appeal to create this transitional collection of occasional tables. 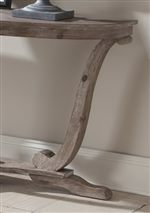 Beautifully crafted from pine solids and veneers each piece has been wire brushed with a stone white wash finish. Cabriole legs support rounded tops to complete the unique look of this collection. The Greystone Mill collection is a great option if you are looking for Transitional furniture in the Jackson, Pearl, Madison, Ridgeland, Flowood Mississippi area. Browse other items in the Greystone Mill collection from Miskelly Furniture in the Jackson, Pearl, Madison, Ridgeland, Flowood Mississippi area.